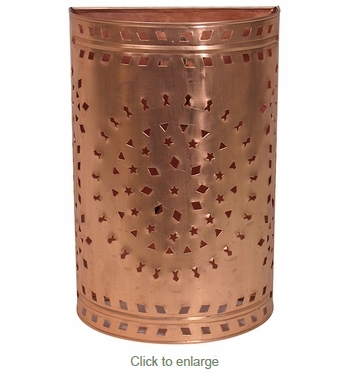 Our natural copper wall sconce will compliment any southwest or rustic decor. Each wall sconce is hand crafted, variations in color and finish may vary slightly from what's pictured here. All of our Mexican wall sconces are authentic creations handmade by artisans in Mexico. Comes Pre-Wired with Socket. Available Unwired. Please call or tell us in the comments section at checkout. Unwired version is the sconce only, without a bulb socket.